I think this is the cruelest thing Mordred’s done to date. Some of you may disagree, but I’ve had someone come behind me and cut my hair off during class back in high school (not quite to this extent, but it was a good chunk) and I was so upset. Especially since my hair is the same length as Wiglaf’s; it takes a long time to grow that. 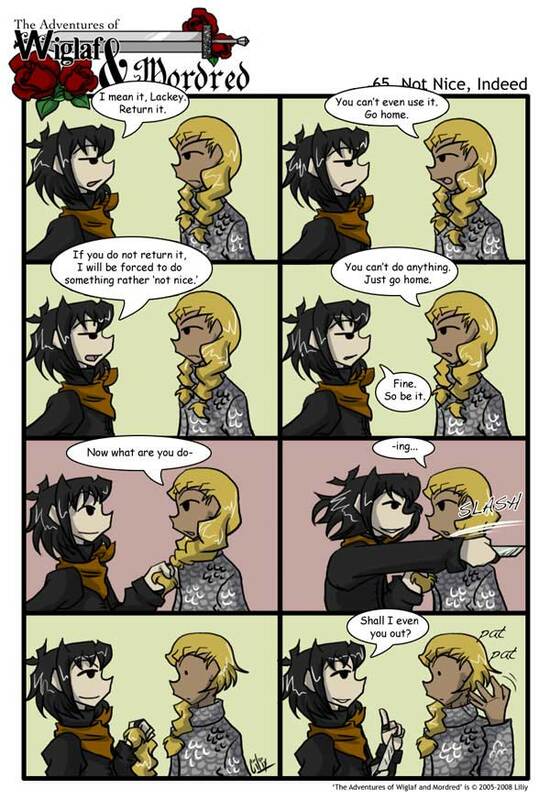 But that doesn’t change the fact that I love how Wiglaf in the second to last panel turned out. Though, my bias towards Mordred is showing up again. Heh. Boy, Mordred is just begging for a left hook to the jaw with this. Can’t wait to see what Wiglaf does for sweet payback. I’m enjoying their hard glares in the first four panels. Mordred, I think you just proved yourself as clueless as you claimed you were acting before. You brought a box-cutter to a swordfight. It’s OK, Wiglaf. You can donate your braids to Locks-of-Love. No, I cant’ say that we got along. Though I don’t remember doing anything to her to deserve the action in the first place. Oh… just… wow. I can’t believe Mordred just did that. Hair is sacred. You do not mess with someone’s hair. I have a feeling that it’s not going to magically regrow after this conflict, is it? LOL. Mordred is so stupid. XD Sorry, you know how I feel about him. We’ll see what happens, though; I could definitely see Wiglaf throwing a punch or two over this. Also, why did it take me forever to notice Wiglaf is dark skinned and fair haired while Mordred is the oppisite? I’m so used to blondes being pale. I totally didn’t notice till now that the Wiglaf in the heading bar has short hair! :happy: haha, poor muffin! That looks like the barber’s razor from Wiglaf theater where Mordred was Sweeny Todd. video needs to be replaced.